Hi foodies...Welcome to AYESHA'S KITCHEN. Pachadi / Raita is a South Indian salad with curd and coconut which is served as an accompaniment to meals. Here am sharing a Carrot Pachadi recipe which is very traditional and authentic side dish prepared during Onam sadhya in Gods own country, Kerala, India. A very healthy dish packed with vitamins and minerals, ease in preparation, attractive texture, a perfect cooler, these all features made me attracted towards this super duper Carrot pachadi / carrot raita. 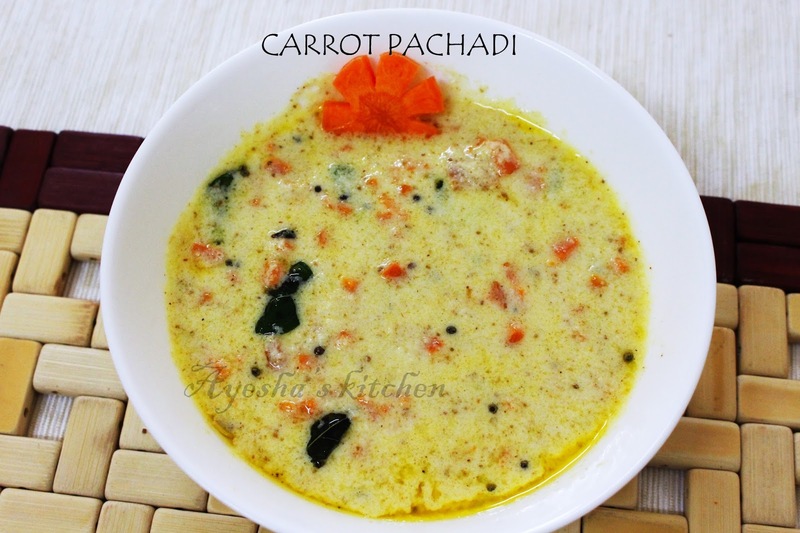 Here is the recipe showing how to make carrot pachadi. Heat a pan and add 3 tbsp of oil. When hot, add finely chopped carrot along with salt ,turmeric powder and cook it until it becomes tender.Do not over cook. Set aside. Then add curd to the mixer and just grind the mixture for few seconds and mix it with the coconut paste . Mix well and now add the cooked carrot to it. Check for salt. Splutter dried red chilly and mustard seed in a heated pan. Then add curry leaves to it.